The venue for your wedding reception is the thing your guests will remember long after the big day. The venue you choose, more than anything else, sets the tone for the day. From the moment your guests arrive until the moment they leave, the whole atmosphere needs to totally immerse them in your celebration. At the Red Lion, the management and staff have vast experience of hosting weddings but we always treat everyone individually, we know it’s all about your big day. You and your guests are never rushed and you will be met by totally enthusiastic staff who are looking forward to helping you celebrate the occasion. We have wedding co-ordinators who will liaise with you every step of the way so you can relax in the knowledge that every little detail will neatly be in place. We can cater for big occasions with large numbers of guests or intimate weddings with just your closest friends and family in attendance. 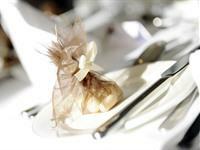 We also offer an extensive Wedding planning service that helps you to plan and manage all aspects of your wedding. From sourcing the cake and table decorations to arranging local wedding entertainment and choosing the perfect wedding band. The best thing to do is arrange to come and talk to one of our planners and discuss all your requirements in detail. We’d be happy to help.